MAXWRAP® is made of strong non-tear and cohesive fabric which does not causes pain or skin irritation, and it is multi-functional and easy to use and apply. By pulling and stretching MAXWRAP®, tension is applied to the affected area while pressure produced by the silicone strips against the skin generates a greater compression effect and offers better protection on injured area compared to standard elastic bandages. 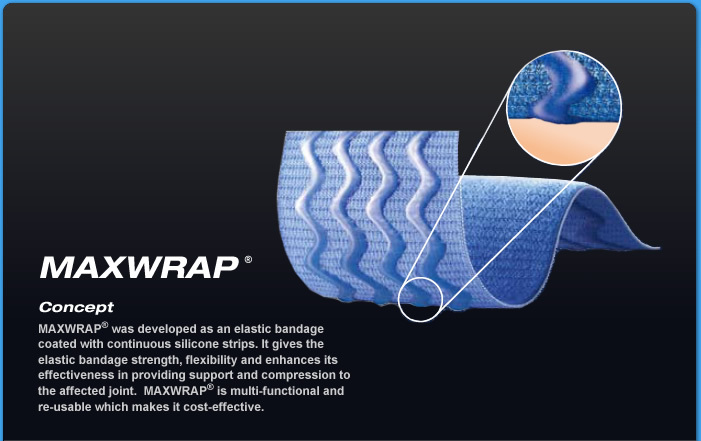 By stretching MAXWRAP® and wrapping it around the injured joint, it provides localized support and compression avoiding unnecessary compression on areas where it is not needed. By pressing the silicone strips against the skin, MAXWRAP® generates a greater compression effect and offers better protection on injured area. It is comfortable to wear and painless to remove. MAXWRAP® is washable, will not lose its effectiveness, is made of non-tear fabric. It is a re-usable, cost-effective strapping system for maximum value.